› Author AffiliationsFunding from the European Union’s Seventh Framework Program for research, technological development and demonstration Grant No. 621364 (TUTIC-Green) and from Tallinn University of Technology (Grant No B58) is gratefully acknowledged. M.I. and M.B. are grateful to Dora Plus program for financial support of a short research stay at Tallinn University of Technology. J.A. acknowledges support by the ­Estonian Ministry of Education and Research through grant IUT23-7 and the EU European Regional Development Fund through grant TK134. Support from COST Action CA15106 ‘C–H Activation in Organic Synthesis’ (CHAOS) is gratefully acknowledged. 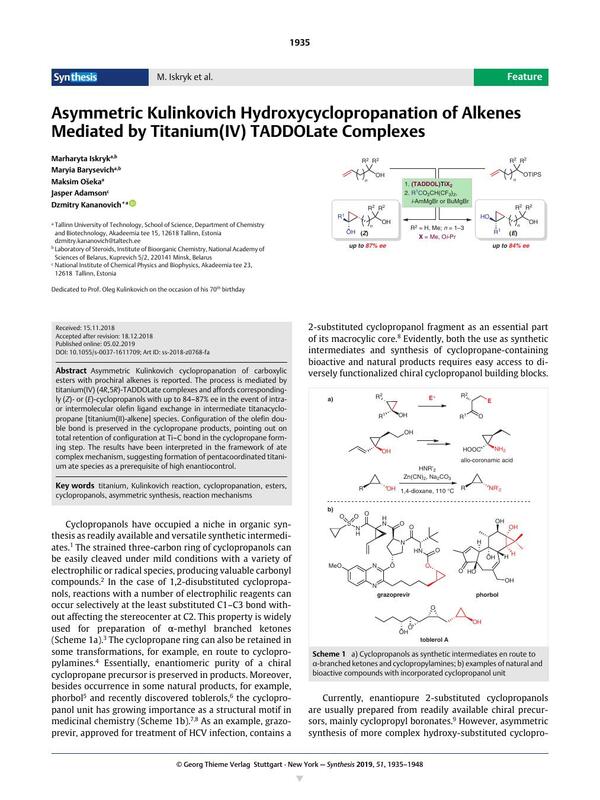 Asymmetric Kulinkovich cyclopropanation of carboxylic ­esters with prochiral alkenes is reported. The process is mediated by ­titanium(IV) (4R,5R)-TADDOLate complexes and affords correspondingly (Z)- or (E)-cyclopropanols with up to 84–87% ee in the event of intra- or intermolecular olefin ligand exchange in intermediate titanacyclopropane [titanium(II)-alkene] species. Configuration of the olefin double bond is preserved in the cyclopropane products, pointing out on ­total retention of configuration at Ti–C bond in the cyclopropane forming step. The results have been interpreted in the framework of ate complex mechanism, suggesting formation of pentacoordinated titanium ate species as a prerequisite of high enantiocontrol. Supporting information for this article is available online at https://doi.org/10.1055/s-0037-1611709. 23 Dialkyltitanium ate species with β-hydrogens in alkyl groups (e.g., A shown in Scheme 3) are too unstable at ambient temperatures and not suitable for NMR studies. Instead, stable dimethyltitanium analogues can be generated and used as model compounds for testing reliability of mechanistic assumptions (see SI, Section II).